Fringilla bichenovii Vigors and Horsfield, 1827. 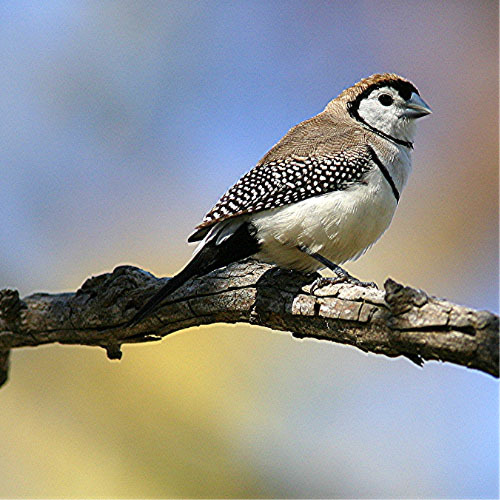 English: Bicheno finch, owl finch, owl-faced finch, banded finch, ringed finch, black-ringed finch; French: Diamant de Bichenov; German: Ringelastrild; Spanish: Pinzуn de Dos Barras. 3.9–4.3 in (10–11 cm). Sexes alike. Juveniles are a paler version of adults. 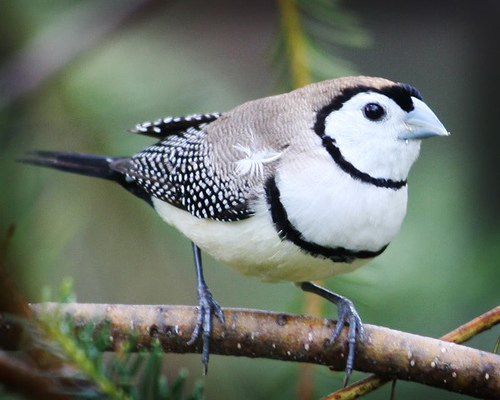 The double-barred finch is brown with white spots on the upper wings. The underparts and face are cream, with the face surrounded by a black ring. There is another black bar across the lower breast. Inhabits dry, open areas including grass plains, open woodland, forest edges, cane fields, inhabited and cultivated areas, and parks and gardens. Found in small flocks during the breeding season and in larger flocks when not breeding. Roosts communally in specially built nests. 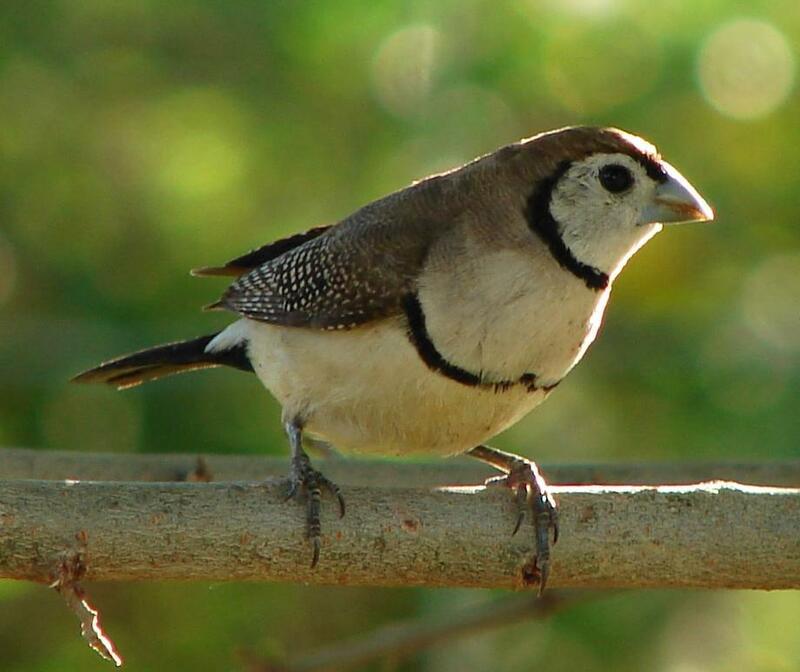 The call is a “tat, tat” or a “tiaat, tiaat.” The song is a softer version of that of the zebra finch. 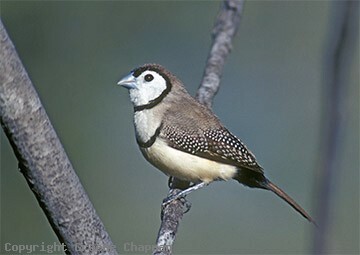 Feeds among grasses and on the ground where it consumes a variety of seeds and undoubtedly a small quantity of insects. This species drinks in a pigeon-like manner. Breeds year-round with three to six white eggs laid. Builds an almost spherical nest of dry grass stems or uses old nests of other species. 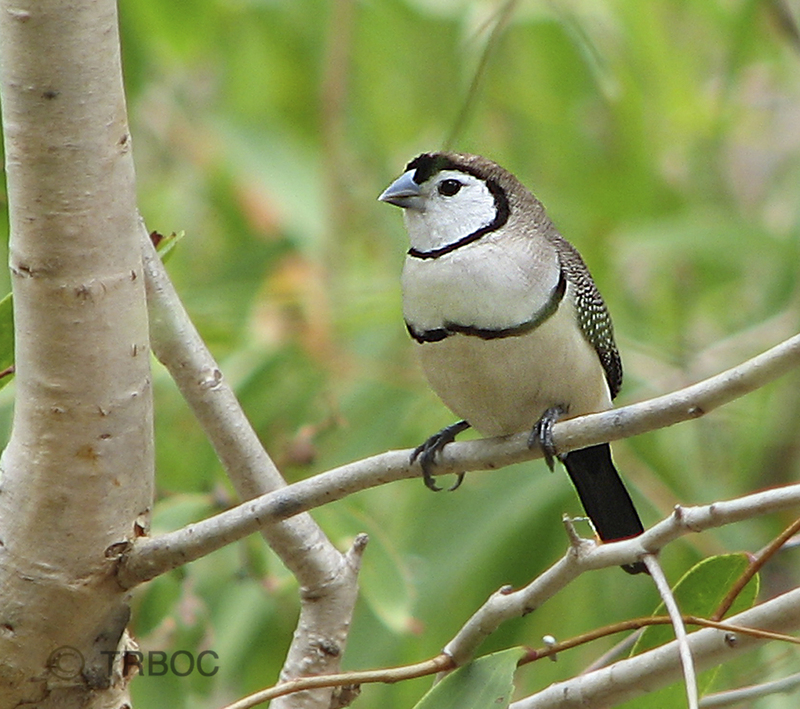 Commonly kept and bred in captivity where it is known as the owl finch.